Introduce students to the economic powerhouse of modern Europe, Germany, where East meets West and poignant reminders of WWII and the Cold War bring learning to life. Discover historic monuments, museums, galleries and even the castle that inspired Walt Disney’s Sleeping Beauty. Guided Tour Arrive in Munich, Germany. 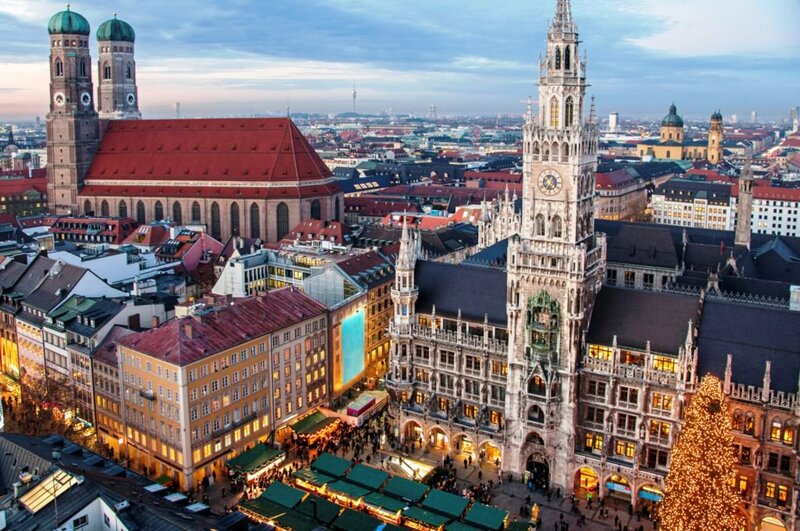 A local guide will lead you on walking tour of the city taking in the sights of Marienplatz, Maximilianstrasse, Hofbrauhaus and many others. Dachau Board your coach to visit the Dachau Concentration Camp Memorial site. Deutsches Museum Afterwards, visit the Deutsches Museum and learn about masterpieces in science and technology. Journey to Rothenburg Head down Romantic Road in southern Germany to Rothenburg. En route stop by Neuschwanstein Castle, one of the most recognisable castles in Europe. It is also known as Walt Disney’s inspiration for Sleeping Beauty’s castle at Disneyland. Discover Rothenberg Enjoy a guided walking tour of Rothenberg’s old town centre. Remaining virtually unchanged since the 16th century, the town takes on a medieval feel. Journey to Nuremberg Afterwards, board your coach to Nuremberg to visit the Nazi Party Rally Grounds and Documentation Centre. Guided Tour Explore the city’s sights on a guided walking tour, including the medieval dungeons located under the Town Hall. A city of great importance during Nazi Germany, Nuremberg is still home to remaining Nazi architecture around the city. Welcome to Dresden Arrive in Dresden, an ancient Slavic settlement that has a long held reputation as a cultural, educational, political and economic centre of Germany and Europe. Guided Tour Take a guided tour of the city, once the epitome of elegance before it was reduced to rubble after being bombed by British and American forces in WWII. On the move En route to Berlin stop off at Leipzig. With connections to famous composers Mendelssohn, Schumann and Wagner – Leipzig is known as Germany’s most musical city. Explore Leipzig With time for independent sightseeing, you might like to visit St Nicholas’ Church, one of the city’s most famous churches. Journey to Berlin Continue on to Berlin, a city once divided between Capitalism and Communism by a 43km wall through its very heart. Discover Berlin Journey on a walking tour of Berlin, starting at the city’s famous Brandenburg Gate and including the Reichstag (Parliament), the new Holocaust Museum and the site of Hitler’s bunker. Follow the “death strip” to Checkpoint Charlie, the infamous checkpoint between East and West Berlin and see the iconic remnants of the Berlin Wall. Afterwards stop by the DDR museum to experience firsthand what life was like behind the wall. Cold War Experience Make your way to the Checkpoint Charlie Museum; located between East and West Berlin, it chronicles the Cold War years. Afterwards stop by the Story of Berlin interactive museum and learn about the city’s 800 year history. Berlin Unterwelten Later, take a tour of Berlin’s Unterwelten – the underground bunkers and shelters used during World War II. Final Farewell Say auf wiedersehen to you depart Germany for Australia. Thank you for your interest in our WorldStrides East Meets West – Germany Tour! Please tell us a little more about yourself so we can get you sent to the right place.